When advertising on Facebook, you often find yourself troubleshooting ad campaigns that aren’t working. Popular belief is that with Facebook ads, only the images matter; the copy does not. Most marketers also believe that the copy should be short. AdEspresso then polled marketers to see which variation they thought would win. Nearly half of the marketers polled guessed Variation A: One Sentence would win. But not only did Variation A NOT win. It also had a much higher CPA. Turns out Variation E: One Paragraph was the ultimate winner, followed closely by Variation F: Two Paragraphs and then Variation G: Six Paragraphs. Even better? Not only did the longer copy in these ads bring in the most leads… but long copy also had the lowest CPAs across the board. 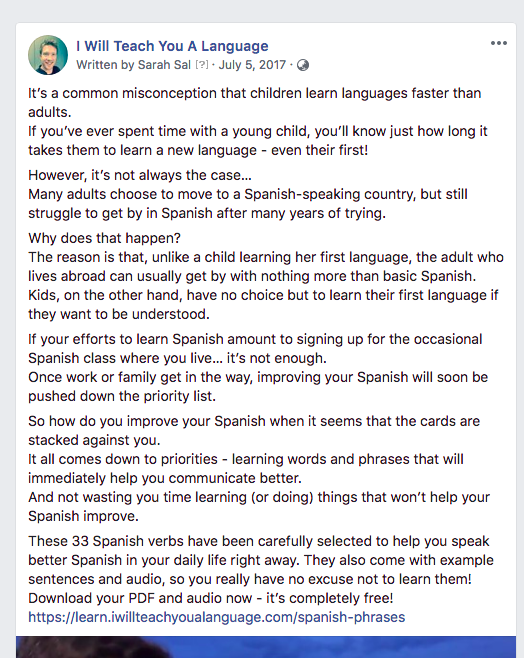 But maybe you’re still not sure long copy actually works in Facebook ads??? 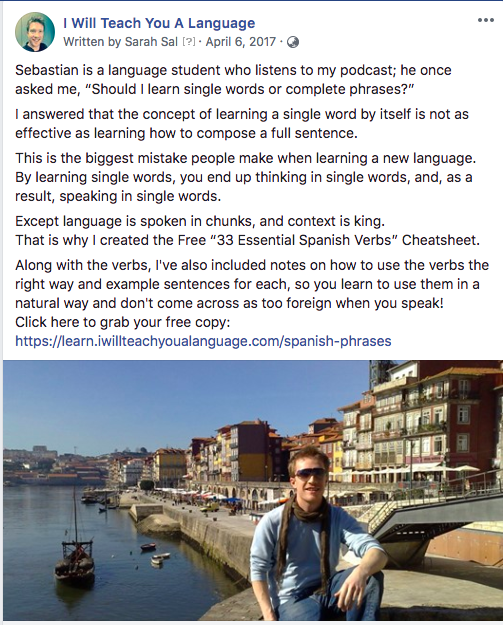 I Will Teach You a Language is a website for learning new languages quickly through storytelling. For the past three years, FB ads have been consistently building their email list. 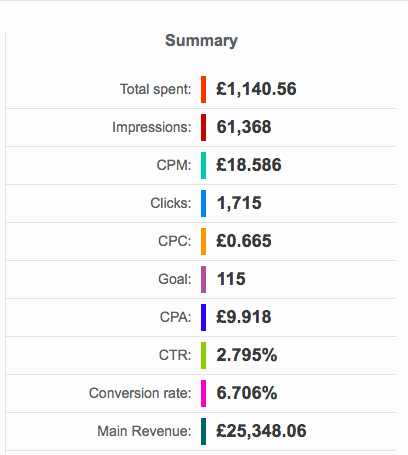 In a recent seven-day period, they received 3,118 email opt-ins at £0.54/lead. The secret is no secret at all: writing lots of ads which engage in storytelling, using long copy. 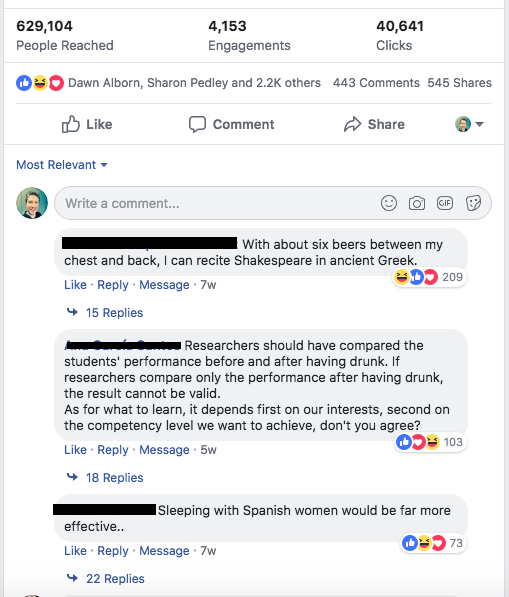 And now take a look at the comments! 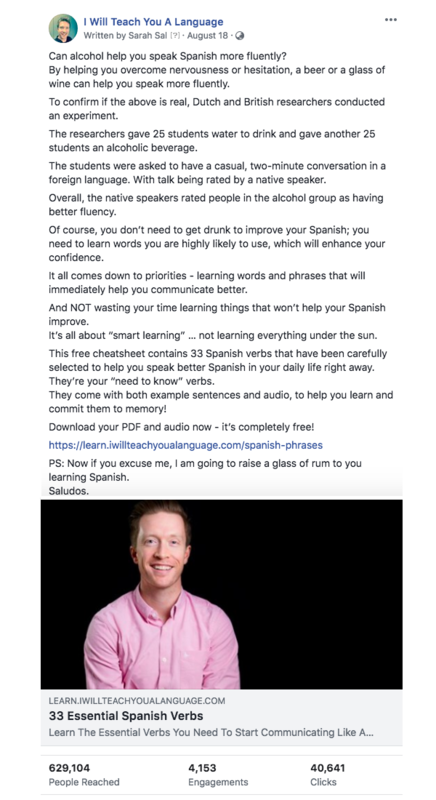 That ad got 2.2k likes, 545 shares, and 443 comments (708 total comments, if counting nested ones). Long-form copy has been given a bad rap in the marketing world. People love to tell you that nobody reads online. And here’s the thing: that can be very, very true. Don’t write for the people who don’t read online. Write for the people who do. Below you’ll find 10 techniques for using long-form content and storytelling in Facebook ads. 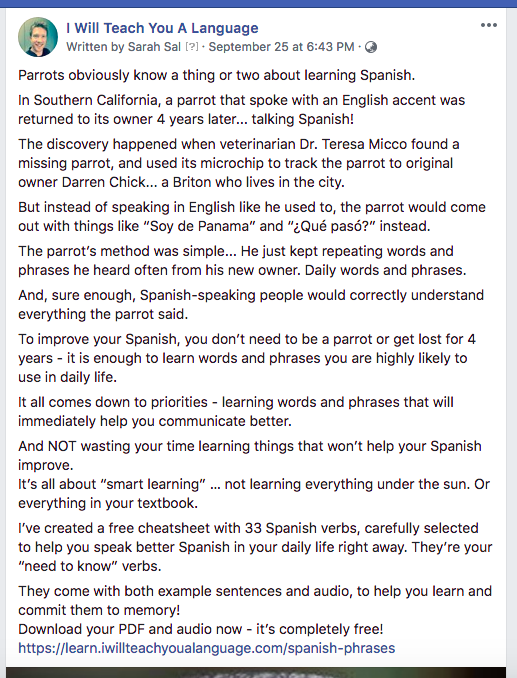 It’s a long read but if you run Facebook ads (or consider running), it’s worth reading in its entirety. Writing high-converting Facebook ads can feel intimidating, but you really don’t need to be an experienced copywriting expert to knock it out of the park. Good ad copy comes 90 percent from reading and listening, and only 10 percent from the writing itself. If you were reading a page from your ideal customer’s diary, what would their struggle look like? We built desire before pitching. We didn’t go for the hard sell. We captured attention, provided value… and then appealed to a need. At the end, we finally offered the solution: a downloadable training kit. We were specific. We used a singular, detailed story that many people can relate to in order to evoke an emotional connection. We didn’t just say, “She felt like she wasn’t part of society.” We SHOWED how she didn’t belong. If you can apply specific storytelling to a pain point, you’ll see great results. We didn’t cut out the stuff most marketers cut out. The parts of the ad copy that most engage your reader are the details. We didn’t lose sight of the need for details, and we didn’t prioritize some random idea of “always be short” over the power of storytelling. Facebook is for new things. New announcements. New life changes. News. And new forms of news. So little wonder stories that seem immediately relevant perform well as Facebook ad copy. Many stories that get covered by the media COULD relate to your niche. Spin the story into an ad. The comments section on an ad will be filled with everything from the hilarious to the outrageous. That’s a seed of an idea right there. You can use a different spin on storytelling – and some humour – to make a point. That Facebook ad copy follows the old copywriting rule: the job of a line of copy is to get your reader to read the next line. Short copy doesn’t build up to the next line. Long copy does. Analogies are powerful in sales. They help people understand more quickly – they’re a shortcut for actual knowledge. 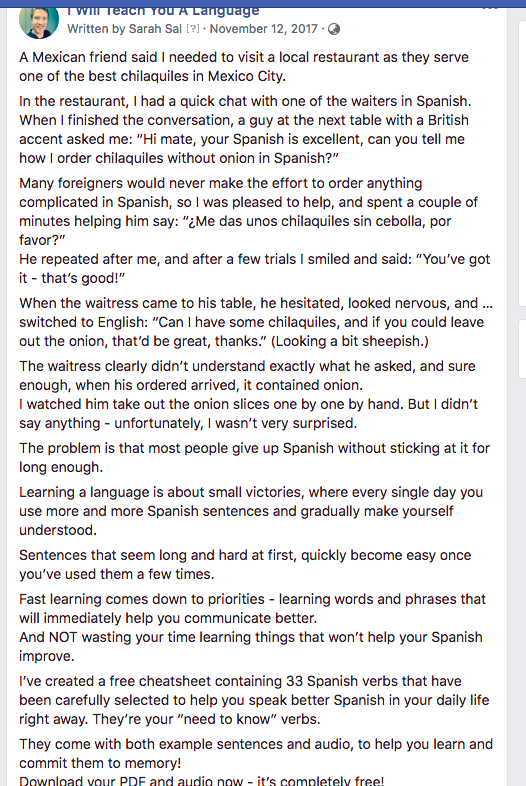 For example, if you asked “What does a Pomelo taste like?” and got an answer “Like a grapefruit but without the bitterness,” you’d get it. Try to address what an ad will be about in the first sentence; doing so keeps people engaged. 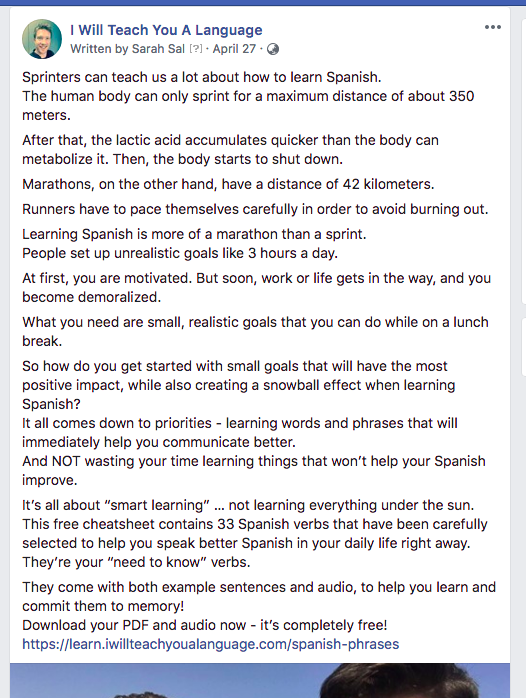 You don’t want someone to read three paragraphs about running before they realize that it’s really about learning Spanish. Make the analogy clear up front. 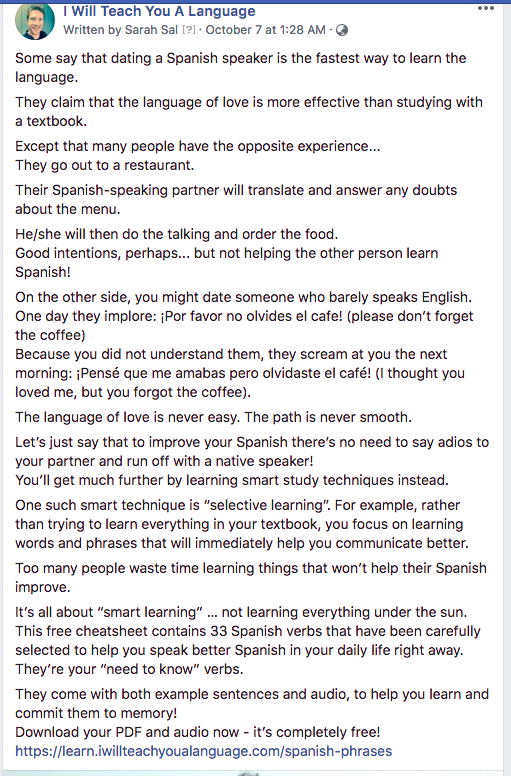 Let’s say you help people learn to cook Italian food. Fixing common mistakes for your readers builds trust and demonstrates credibility while offering value. 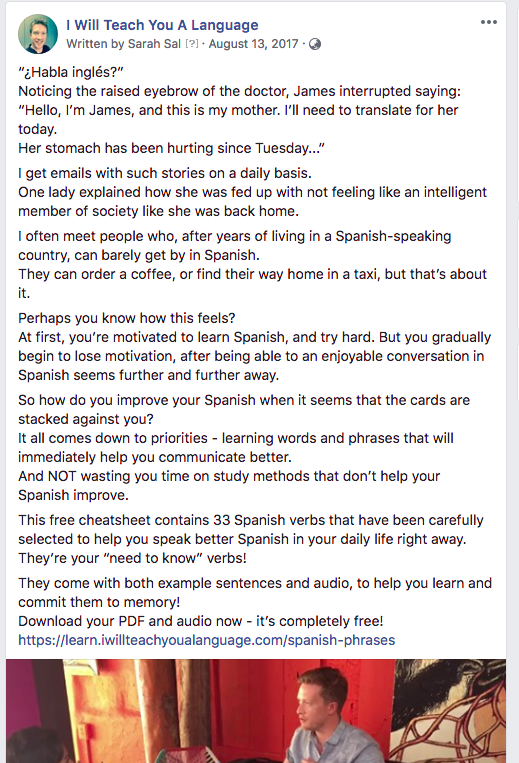 Here’s a Facebook ad that uses this strategy, highlighting simple mistakes and showing the fix. All industries are plagued by misconceptions that affect their image. It’s the reality of life. What’s one question you’re asked over and over? There’s got to be at least one. Answering questions that your audience frequently asks will strike a chord with many members of your target audience, who almost certainly have the same Qs. It’s also another great chance to offer value to your audience and build a relationship with them early on. After all, for every person who dared ask a question, there are at least a thousand others who have wondered the same but never voiced it. Reaching out to your clients offers a number of benefits. 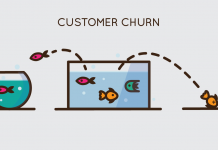 You can ask users how they’ve benefited from your product / service / solution and try to find out what made them convert in the first place. If you can, dig deep. You want to go beyond the general testimonial of, “He’s nice. I got good results.” You want specifics, and asking the right questions can help. What was it like before working with / finding our product? How did X help you? 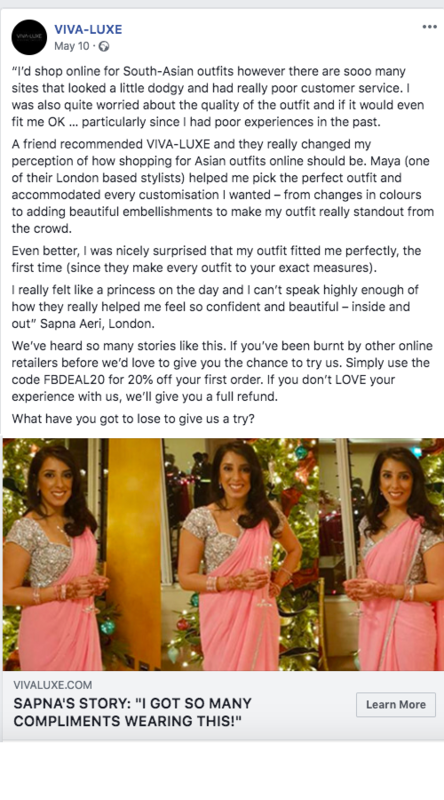 What mistake did you stop making after working with / finding our product? How did you address that mistake? 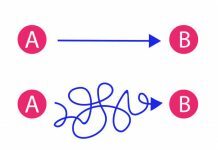 What’s one new thing you learned, or one benefit you gained, and what difference did it make? Great copy takes what your prospect says / thinks… and puts it on the page. Your prospects then read the copy. And it feels like you’re inside their head. NOT because you’re a genius. But because you listened to them… you documented what they said… and you used it to write the ad they then read. It’s not about you. It’s not about your product. 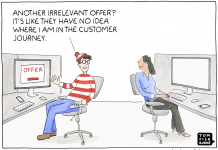 It’s all ALWAYS about your customer. 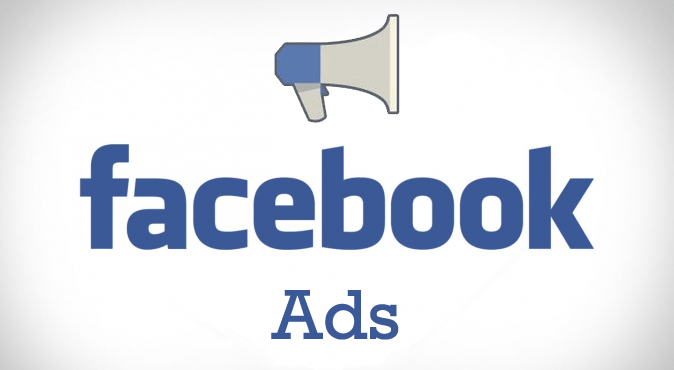 Facebook ads can be used to disqualify your competition, giving potential customers reasons to choose you instead. When you say the same thing as everyone else, your selling power weakens and your message is diluted. People assume you have nothing different to offer because surely you would have mentioned it otherwise. Viva-Luxe needed their ads optimized. This is a British brand that sells high-quality, made-to-measure Asian fashion. What’s unique about your product? Your team? Your service? Your location? Your facilities? Your process? Your motivation? Your story? 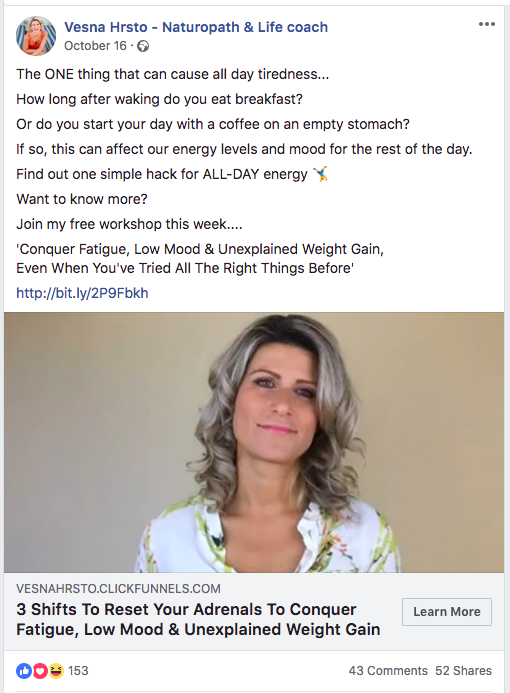 Why isn’t any of that guiding your Facebook ad copy? Your product or service will likely have many different use cases. It might solve different pain points that mean something different to each audience member. Facebook ads are waiting to happen in each different use case. When creating your Facebook ads, you need to consider the top five to 10 reasons that anyone might need your product or service. You then need to branch those reasons off into their own distinct ads. Vesna Hrsto, one of the top 10 naturopaths in Australia & New Zealand, did something like this. Hrsto helps people suffering from adrenal imbalances. One of the symptoms of adrenal fatigue is weight gain. Some members of Hrsto’s audience will care about weight loss, others will care about feeling tired, others will care about being moody – the list goes on. Among her many ads, she ran one about helping people have more energy. That ad body copy focused not on ALL the whys… but just on one: being tired. Not only did the ad get webinar registrations at $3.5/lead in the first week we launched it, but it also quickly generated five sales at a CPA of $90.58/sale – for a product that cost $497. Does long-form ad copy always work, then? Long-form copy doesn’t work BECAUSE it’s long. Short copy can work wonders for highly engaged fans… for high awareness audiences… for markets that are extremely sophisticated… and for smokin’ great offers on products people already know and love. Long copy can work wonders for newer fans… for low awareness audiences… for unsophisticated markets and disruptive products… and when you need to move a reader through multiple stages of awareness to get to a paid offer. PS. In addition to copy, don’t forget to test everything else: targeting, demographics, lookalike audiences, frequency etc. Combined, you should see great results and profitability.